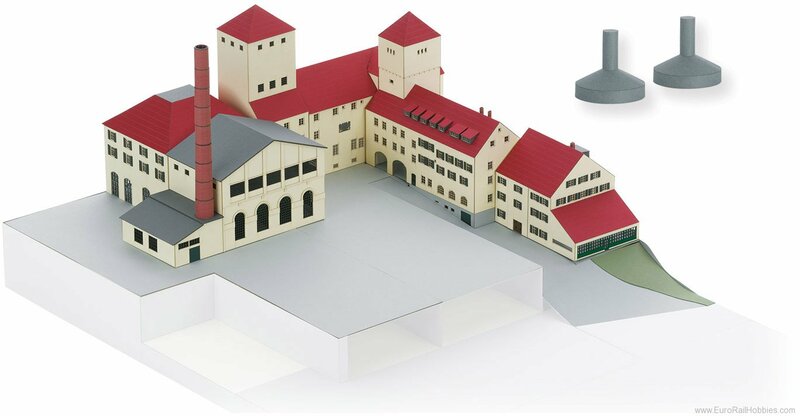 Model: "Weihenstephan" Brewery Kit Part 1 includes the following buildings (basic dimensions in parentheses): - Administration building with mural (182 x 72 mm / 7-3/16" x 2-7/8"). - Entrance with tower (62 x 72 mm / 2-7/16" x 2-7/8"). - Seminar building (118 x 109 mm / 4-5/8" x 4-1/4"). - Brew house with chimney (191 x 88 mm / 7-1/2" x 3-1/2"). - Residential building with corridor (176 x 66 mm / 6-15/16" x 2-5/8"). - Beer pub (126 x 85 mm / 4-15/16" x 3-3/8"). - Substructure (410 x 410 mm / 16-1/8" x 16-1/8"). Part 2 available under item number 66321 is required to represent the brewery as it currently looks. This kit consists of laser-cut, colored architectural hard cardstock. It has the finest laser-engraved details. Extensive instructions for building the kit are included.